Affected customers have been told they can get a refund or free move to the next available flight. 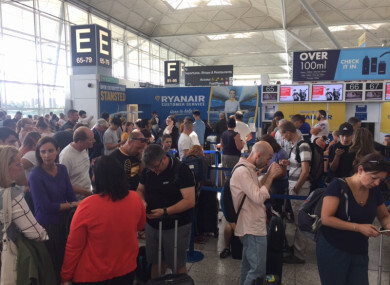 RYANAIR HAS APOLOGISED to customers after they were forced to cancel a number of flights at Stansted due to thunderstorms. Flight services across the UK have been severely disrupted after restrictions were put in place by air traffic control due to the weather. Passengers have described chaotic scenes at Stansted Airport today as the knock on effect has caused further delays and cancellations. In a statement Ryanair said: “Due to thunderstorms in Stansted last night (27 July), Ryanair were forced to cancel a number of flights. The knock on effect of this and ATC staff shortages has caused further disruptions today (28 July) including delays and cancellations. “Affected customers have been notified be email and SMS text message and advised of their options of a refund or free move to the next available flight. Email “Ryanair forced to cancel number of UK flights over thunderstorms”. Feedback on “Ryanair forced to cancel number of UK flights over thunderstorms”.